Sabrina has been trying to be the perfect child her entire life to convince her parents that she's more than just an "accident." Now she is determined to go to her dream college, but her parents want her to stay close to home. Desperate times call for desperate measures, and Sabrina must team up with an unlikely ally- a guy she hires to pretend to be her stalker- to get what she wants. But when her scheme... goes according to plan, and people believe he is really stalking her, her new feelings for him prove most inconvenient. 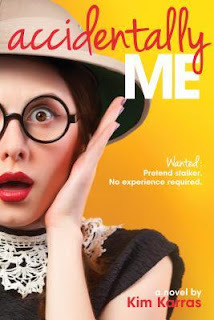 Poor Sabrina gets herself into quite a mess in this quirky young adult/new adult novel. Granted, she doesn't have any experience standing up to her parents, and when her underhanded way of trying to manipulate them quickly gets out of control, she only ends up making things more complicated. She has an inner sassiness that is fighting its way out, but manifests in whining and bickering with her sister. She is a little self-absorbed as most 18 year olds are I'm sure, but as she is humbled by her experiences she learns to not take her family for granted. Calvin is somewhat of an enigma, and even though he has his share of flaws, he helps Sabrina realize her true fears that she must conquer in order to claim independence. The secondary characters are vividly portrayed through the lens of Sabrina's perspective, and I loved the fun coincidences of a shy admirer popping up here and there in the story, throwing Sabrina off guard in the middle of her self-inflicted drama. There were some difficult lessons she learned but the story ends on an upswing that melted my heart.